Take a look at our huge selection of Pop! Vinyl Figures, Action Figures, Statues, Construction Toys, Mini-Figures, and Transformers! Well, I'll be darned… it's Figaro! Cheery statue based on the animated classic Pinocchio. Vividly hued recreation of one of Disney's most lovable felines. Designed by pop artist Romero Britto! Figaro from Walt Disney's animated classic Pinocchio comes to 3D life in this vividly hued recreation of one of Disney's most lovable felines! Black "diamond dust" adds extra sparkle, and nylon whiskers frame Figaro's purr-fect smile. 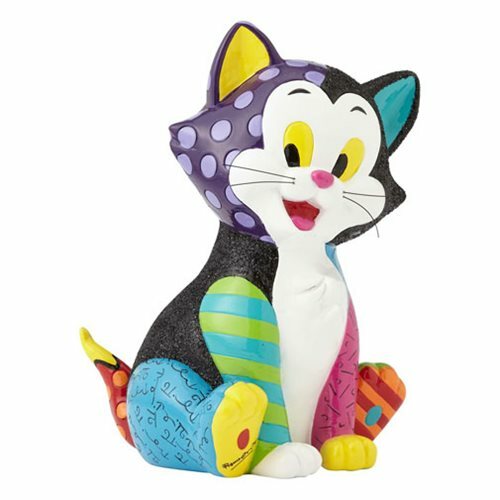 This cheery Disney Pinocchio Figaro the Cat Statue by Romero Britto is made of stone resin and measures approximately 7 1/4-inches tall x 5 1/4-inches long x 4 1/2-inches wide. Romero Britto is a Brazilian neo-pop artist, painter, serigrapher, and sculptor who combines elements of cubism, pop art, and graffiti painting in his work, using vibrant colors and bold patterns as a visual expression of hope and happiness.